This is the ninth post in the series “Engineering in an Age of Limits”. We are facing limits in natural resources, particularly oil; there are limits to our finances (money seems to be increasingly disconnected from actual goods and services); and there are limits to how much we can continue dumping waste products into the air, the sea and on to land. This is the final post in the series to do with my personal journey into understanding the Age of Limits. We have already looked at resources and the environment — the third topic is money. It is also the most difficult to write about. Resources such as oil are moderately simple to measure and understand. And, to an engineer concepts such as the Hubbert Curve and Energy Returned on Energy Invested are not hard to grasp. Environmental issues are more complex but they also are physical phenomena that can be analyzed technically. But money is much more nebulous because it is a token for physical goods — it has no inherent value. With regard to resources I have mentioned that a small number of people (Simmons and Hubbert in particular) provided me with a foundational understanding. With regard to environmental issues, particularly global warming, I have mainly soaked up information from many sources. 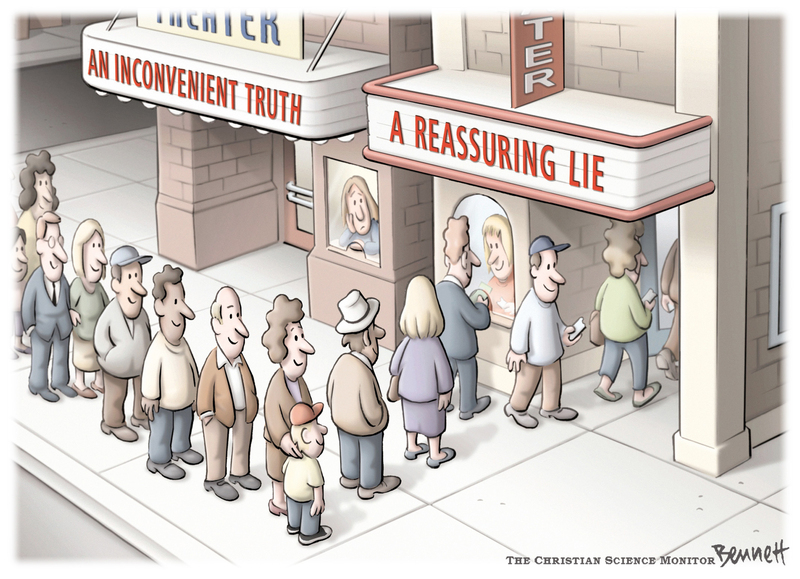 I have already referenced Al Gore’s An Unpleasant Truth (in not an entirely complimentary vein). 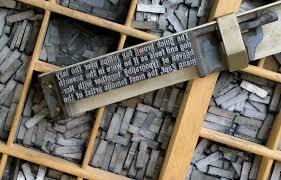 Other writers could be cited — sufficient to say that there is no shortage information about how we are wrecking the environment. A few thoughts on financial topics are presented here — we will explore them in more detail in later posts. All I am trying to do for now is to describe my personal journey into understanding the Age of Limits and what it means for engineers. But, at the heart of this discussion, is a recognition that economic issues are not stand alone — they are connected to the world of physical resources. So, for example, adding money to the world’s economic systems in the hope that doing so will generate growth is foolhardy once one understands that there are insufficient resources to back up that stimulus, and even if we could jump start the economy in this manner we would simply add to our limits with regard to the environment. At the heart of our economic predicament lies the inexorably declining value of Energy Returned on Energy Invested for oil and other critical energy resources. This is a concept I have discussed in Nine Pounds of Gold, and, because of its importance to all Age of Limits discussions, it will keep cropping up in future posts. This annual increase of around 3% is, in effect, a non-productive tax. It is the amount we pay to the oil producers to find, extract and refine the oil that is so necessary to our society. And it is incremental — every year the “tax” increases another 3%. And, given that we have already depleted the low-cost oil and gas fields, this tax will continue to increase. The goods and services that are used to produce the new oil are not available for other projects or activities. They are used, in ever increasing quantities, just to maintain the status quo ante. The world’s production of crude oil probably reached a peak around the year 2005. However, it is difficult to know exactly when that event occurred for the following reasons. On a year to year basis production rates do not change all that much, which is why I prefer not to use the term ‘Peak Oil’. It would be better to say ‘Peak Plateau’. There are many factors such as political and economic issues that can cause large fluctuations in the short term. The term ‘Crude Oil’ can mean different things to different people. In particular, it is important to know whether a person is including Natural Gas Liquids and Condensate as being part of the crude oil supply. Given all these caveats, it appears as if the world’s production of conventional crude oil reached a plateau of around 75 million barrels per day in the year 2005 and has remained at that value since. In the last few years that number has been significantly supplemented by tight oil production from North America. However that source is already declining because the wells have a short life and lower prices make tight oil uneconomic. Demand in the United States has fallen but in China and India it has gone up — so these two factors appear to have cancelled one another out and we are in rough equilibrium. Projections for the next twenty years show a steep decline in production rates, as shown in the chart below. The chart shows the production of conventional oil falling from 80 to 30 million barrels per day by the year 2030. Most of the gap is made up by production from ‘Unidentified Projects’, which, by definition, are unidentified. Even if those projects can be identified it will take many years to bring them up to speed but the chart shows that we do not have many years. 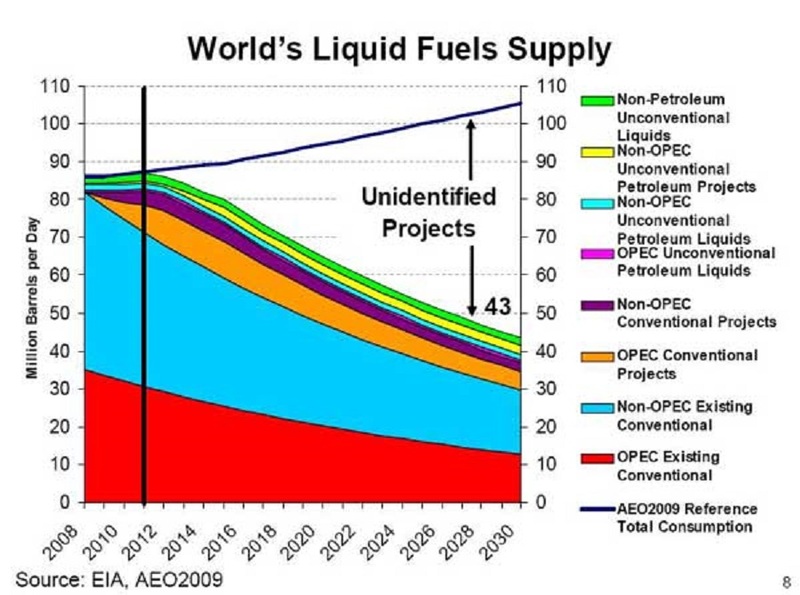 Moreover, charts such as this make no mention of ERoEI — they make no mention as to how conventional oil will have to be diverted to provide the energy needed to develop and implement these Unidentified Projects. I grew up at a time when inflation rates were high — and high inflation is something I never want to see again. When I first looked into the topic of Peak Oil I assumed that the price of oil would go up; this would be followed by general price increase and high inflation rates. However, at the the blog The Automatic Earth the authors Ilargi and Stoneleigh (Nicole Foss) make the argument that deflation is our biggest challenge. They make an argument on the following lines. Reduced supplies and increased prices for oil and other commodities reduces demand. The economy contracts — in particular, people lose their jobs. This reduces spending power and so prices fall. In such an environment cash is king and debt is to be avoided at all costs because jobs and other sources of income will dry up but debt payments will still have to be made. In October 2009 Stoneleigh (Nicole Foss) made the following forecast.
. . . I would say that the energy prices that currently seem stubbornly high should fall substantially as the speculative premium evaporates and demand falls on a resumption of the credit crunch. The result should be a reversal of a number of trends that depend on the ebb and flow of liquidity – we should see stock markets and commodity prices fall, a significant resurgence in the US dollar and a large contraction of credit. The scale of the reversal should be substantial, as should its effects on energy demand. Demand is not what one wants, but what one is ready, willing and able to pay for, and in a severe credit crunch the capacity to pay for supplies of most things will be severely reduced. As demand falls, and with it prices, investment in the energy sector is likely to dry up. Many projects will be uneconomic at much lower prices, meaning that the projects which might have cushioned the downslope of Hubbert’s curve (and the much steeper net energy curve), are unlikely to be developed. In this way a demand collapse sets the stage for a supply collapse that could place a hard ceiling on any prospect of economic recovery. That is a recipe for extremely high energy prices in the future. Apart from continued high stock prices her words are prescient. 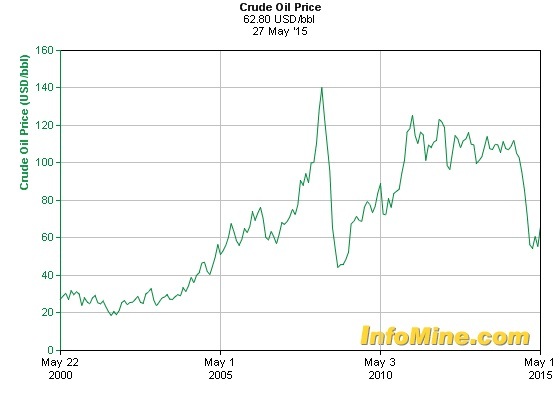 The recent drop in in oil prices was caused by short-term political issues. But behind the fall lies a reduction in demand as the economy contracts — or at least, fails to expand. Those words were written in June 2009 — more than five years ago — and our local freeway seems to be as congested as ever. Where did all this excess financial capital come from? Not from savings (China excepted), but from new money and easy credit generated by our fractional reserve banking system, amplified by increased leverage in the purchase of stocks. In other words, capital is not created from savings or from returns on successful projects. And the reason for this is that we are depleting our natural resources. And the reason that real growth cannot be achieved is that we no longer have the natural resources needed to sustain that growth.
. . . growth in yesterday’s empty-world economy was reasonable — in today’s full-world economy it is not. In other words, few high return projects are available because we have entered and Age of Limits. This post concludes my very brief overview of my personal journey into understanding the Age of Limits, how it will affect engineering and how engineers can help some of the wrenching changes that are about to occur. We will continue writing posts at this blog on a weekly basis, at time permits. This is the eighth post in the series “Engineering in an Age of Limits”. We are facing limits in natural resources, particularly oil; our finances (money seems to be increasingly disconnected from actual goods and services); and the environment as we continue to dump waste products into the air, the sea and on to land. The last three posts have described the start of my personal journey into understanding our Age of Limits. They have mostly discussed the limits to do with energy resources: wood, coal and oil. But there are two other types of limit to be considered: environmental and economic (financial). My own journey regarding understanding the Age of Limits has been mostly on the Resource Depletion road. But many others come to this topic through an understanding of changes in the environment, particularly climate change, a topic that we discuss in the remainder of this post. 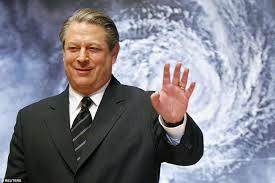 For myself and many others the 2006 video An Inconvenient Truth featuring Vice President Al Gore was a major step in developing an understanding of climate change and the impact that it could have. Since then there have been any number of reports and studies full of complex charts, graphs and tables, all showing that the earth’s atmosphere is indeed getting warmer. There is no point in me trying to reproduce those here. However the following does seem to be a sensible summary as to what is going on. Carbon dioxide (CO2) is a greenhouse gas — it helps keep the planet warm. If it were not present in the atmosphere we would all freeze to death. Since the start of the Industrial Revolution (Thomas Newcomen’s steam engine in 1712) we have steadily increased the concentration of CO2 in the atmosphere through the burning of fossil fuels — first coal and then oil and gas. The earth’s temperature has risen correspondingly. This temperature increase is being exacerbated by increasing methane emissions (methane is a very potent greenhouse gas) caused by a positive feedback loop. We are already approaching a 2°C temperature increase. We are on track for 3°C by the year 2030, i.e., within the lifetimes of most people reading this blog. If the temperature rises by 3°C bad things happen: sea levels rise substantially, crop yields decline and droughts will increase in severity and frequency. If the temperature rises by 4°C then the consequences become truly scary. Some analysts say that we are headed toward human extinction. Although such projections are, in my judgment, an exaggeration it is hard to deny that we are moving into very difficult times. So far our response to this looming crisis has been tepid, to say the least — CO2 levels continue to increase and very little top-down concerted action has been taken. The above conclusions are is well supported by thorough research and climate modeling. So why is there so much controversy? I suggest that the fundamental issue is not do with the science involved but with human emotions and feelings. This is important because, if engineers are to help understand the transitions that we are undergoing then they need to understand that simply presenting hard data and calculations are not enough when it comes to changing people’s behavior. We need to understand psychology and sociology. 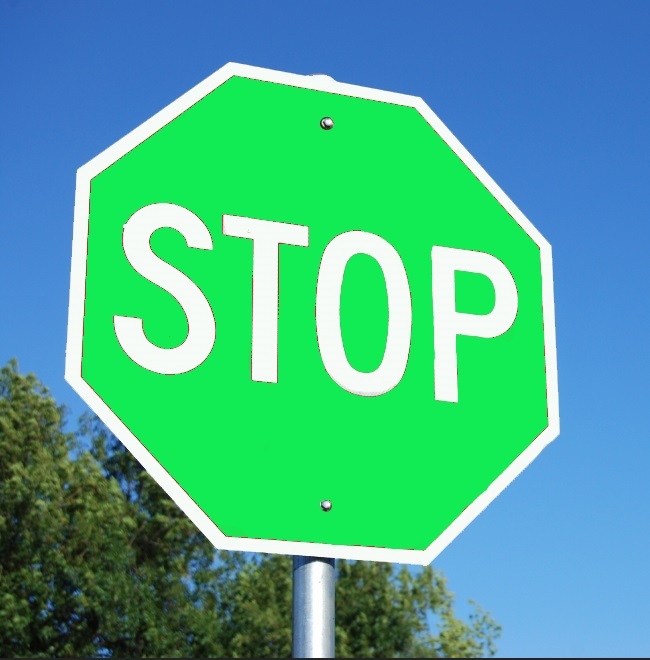 When someone is confronted with convincing information that conflicts with their beliefs then, if they do not change those beliefs, they will undergo what is known as cognitive dissonance. For many people the most obvious cognitive dissonance to do with climate change comes from a perceived conflict between what they read about (mostly on the Internet) and their daily experiences. 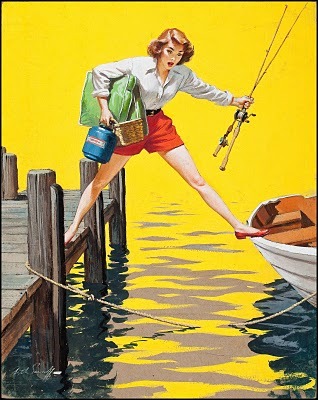 Someone may take the family to the beach for a vacation. When he gets there the ocean seems to be pretty much in the same place as it always has been — what happened to catastrophic sea rise? Or he may be a keen gardener and note that that last frost date seems to be about the same as it always has been. This person’s daily experiences do not align with what he is reading. By living a life that is not in alignment with his stated message Gore, and the many people like him, are creating a dissonance in their listeners and supporters. Some people may decide not to accept arguments to do with climate change (and other Age of Limits issues) because they recognize that doing so will force them to dramatically downsize their high consumption life style, and they prefer not to think about that. If their future is one of say not driving an automobile, growing their own food and living in a non air-conditioned house then that person can choose to deny that future by claiming loudlythat the climate really is not changing, or, if it is, the cause is not man-made so we need do nothing about it. The “Seeing is Believing” response can work in the other direction. And, for many Americans, the drought in southern California is providing an unpleasant glimpse of the future and the reality of global warming. The following is from an April 2015 report published by the California Department of Water Resources. 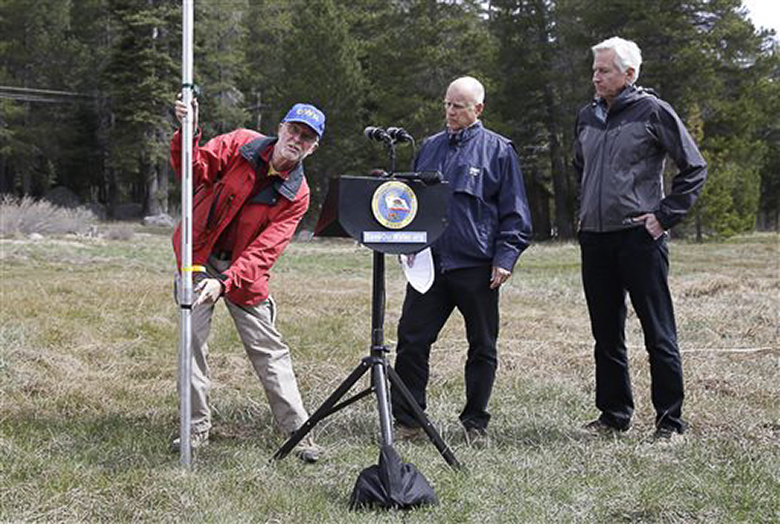 SACRAMENTO – The California Department of Water Resources (DWR) found no snow whatsoever today during its manual survey for the media at 6,800 feet in the Sierra Nevada. This was the first time in 75 years of early-April measurements at the Phillips snow course that no snow was found there. On a personal note I might add that I work with engineers and risk analysts in the State of California. They tend to take the long view to do with most problems, they understand the nature of risk — so they are the opposite of alarmist by nature. But the current water situation in their state really does worry them. It is probable that, in future years, we will see more and more situations such as that in California, i.e., increasing evidence that the climate is changing rapidly, and generally not for the better. 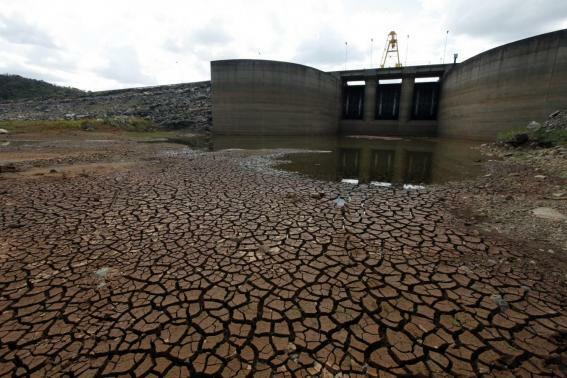 For example, on October 24th 2014, Reuters reported from São Paulo, Brazil, “South America’s biggest and wealthiest city may run out of water by mid-November if it doesn’t rain soon . . . [it] is suffering its worst drought in at least 80 years, with key reservoirs that supply the city dried up after an unusually dry year.” The dramatic reduction in rainfall is attributed to deforestation in the area. It has even been suggested by many reporters that the lack of rain in the Middle East for the last four years is a root cause of the wars and violence in nations such as Syria. One of the goals of this series of posts is to think through the role of engineers in response to the approaching Age of Limits. The emotional reaction to the evidence for global warming shows that a dispassionate presentation of the facts is insufficient; discussions have to address emotions such as anxiety and hope. As people are faced with evidence that these changes are taking place they will struggle more and more with cognitive dissonance — discomfort experienced by an individual who is confronted by new information that conflicts with existing beliefs, ideas, or values. If engineers and technical professionals are to communicate with the general public they will have to be sensitive to these emotional responses. This is the seventh post in the series “Engineering in an Age of Limits”. We are facing limits in natural resources, particularly oil; our finances (money seems to be increasingly disconnected from actual goods and services); and the environment as we continue to dump waste products into the air, the sea and on to land. In the last two posts I discussed two of the authors — Matt Simmons and M. King Hubbert — who helped form my early thinking on what I now refer to as the Age of Limits. In this current post I describe very briefly some of the other events and authors who advanced my subsequent understanding regarding the Age of Limits. Of course, this list is not complete — I will have occasion to cite other writers in subsequent posts. 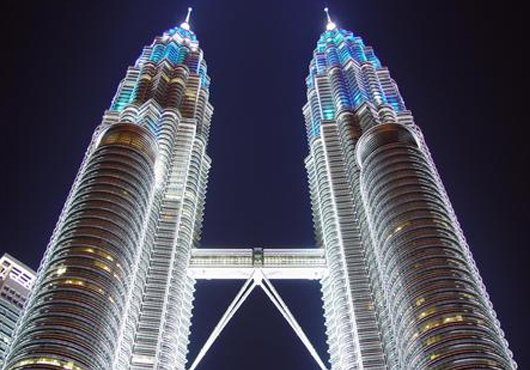 I first started looking at Peak Oil issues when I was working for a large engineering company in Kuala Lumpur, Malaysia. I was part of a team that was designing an offshore oil platform to be located in deep water (about 1000 meters) in a remote part of Malaysia. Like most technical people I was impressed and fascinated by the technical challenges that the project posed. But, as I started reading authors such as Simmons and Hubbert I did wonder at the amount of effort and money that was being spent to find and extract the oil from this remote location. Why was this effort necessary? I worked on another project at about the same time. All of the project team members were given T-shirts on which was imprinted the words, “Mooring Water Depth Record – 7200 ft”. This was not the first time that I had worked on record depth project — there seemed to be a pattern here — the fact that so many projects were to do with production of oil at record depths suggested that the easy oil was gone. Projects such as these were my introduction to the concept of Energy Returned on Energy Invested (ERoEI) — a topic discussed in Nine Pounds of Gold. Much of our understanding of peak oil issues was developed by oil industry experts (particularly retired geologists) who were not directly employed by the industry. These experts applied their expertise to understanding just what was going on. And, being independent, they were free to come up with unappetizing conclusions. 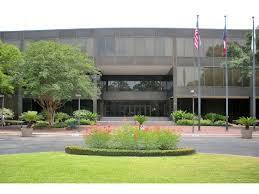 Much of their work was published at the Oil Drum web site. That site has since closed down (although past posts are still available) but it was instrumental in helping technical professionals such as myself develop an understanding of peak oil issues. Not long after returning from Malaysia I attended a two day conference in Washington, D.C. in 2011 organized by ASPO (the Association for the Study of Peak Oil). The conference was well organized and the speakers were both interesting and informative. But what did make an impression on me was the small number of people who take an interest in these issues, an impression that has stayed with me since. There simply aren’t all that many people involved in the peak oil movement. 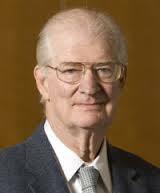 Almost every week since the year 2006 John Michael Greer has published a blog post called The Archdruid Report. 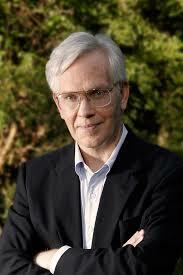 His writing covers a wide range of topics — I will have occasion to refer to his insights in future posts. Because of the scope of his writings it is difficult to summarize them in just a few words, but the following ideas are central to his thinking. In this post I will pick on just one of those topics: Greer’s insistence that we are facing not problems but predicaments. He says that the society that we have developed over the last 300 years is utterly dependent on the availability of fossil fuels — first coal then oil. As the reserves of these fuels decline we will be faced with wrenching changes whether we like it or not. We do not know what the society of the future will look like but we do know that we cannot return to the days of prosperity funded by abundant fossil fuels. This distinction between predicaments and problems is one that engineers in particular do not easily accept. Their culture is one of solving problems, not adjusting to the consequences of predicaments. People tend to come at Age of Limit issues from one of three directions: resource decline, environmental issues or financial limits. What Sweetnam’s chart tells us is that we must find and bring into production the equivalent of five new Saudi Arabias between now and 2030 in order to meet expected demand even if the volume of tight oil reaches its maximum projected output. Obviously there are not “five new Saudi Arabias” out there. Official information from the United States government tells us so. And making up for the identified shortages by the year 2030 is not going to happen. 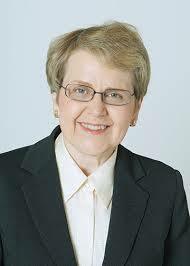 One of the Oil Drum writers was the actuary Gail Tverberg. After The Oil Drum site shut down she continued to publish at her own site — Our Finite World. 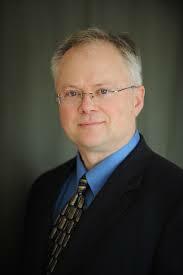 Tverberg focuses on the financial aspects of the Age of Limits, particularly the role of debt. Financial topics are probably the area that engineers feel least comfortable with. The following quotation from one of her recent posts is representative.
. . . economic growth eventually runs into limits. Many people have assumed that these limits would be marked by high prices and excessive demand for goods. In my view, the issue is precisely the opposite one: Limits to growth are instead marked by low prices and inadequate demand. Common workers can no longer afford to buy the goods and services that the economy produces, because of inadequate wage growth. The price of all commodities drops, because of lower demand by workers. Furthermore, investors can no longer find investments that provide an adequate return on capital, because prices for finished goods are pulled down by the low demand of workers with inadequate wages. Chris Martenson at Peak Prosperity provides discussion and advice to do with upcoming crises. Some of the material is viewable by subscription only. However the free crash course provides a thorough and clear explanation as to the changes that are going on. The following is from the web site. The Crash Course has provided millions of viewers with the context for the massive changes now underway, as economic growth as we’ve known it is ending due to depleting resources. The course is organized into the following twenty six video segments that total around two hours of viewing time — two hours very sell spent. His thorough research provides a well-informed basis for discussions to do with the Age of Limits. It can be seen that my education to do with what I now refer to as the Age of Limits came out of my experiences in the oil industry and from reading about Peak Oil (a misleading phrase that I no longer use). Other people approach these issues from either an environmental or financial background. We will discuss these topics in the future posts. This is the sixth post in the series “Engineering in an Age of Limits”. We are facing limits in natural resources, particularly oil; there are limits to our finances (money seems to be increasingly disconnected from actual goods and services); and there are limits to how much we can continue dumping waste products into the air, the sea and on to land. We are also facing a transition as the Oil Age comes to an end. This is not the first time that society has faced such a changeover. At the beginning of the 18th century the principal source of energy in northern Europe was wood. However the forests had been mostly depleted so a new source of energy, coal, had to be developed and exploited. The extraction of coal from underground mines posed new technical challenges particularly with regard to removing the water that flooded those mines. So new technologies, particularly the steam engine, had to be developed. Necessity was indeed the mother of invention. These technological developments led to many changes in society, including the creation of the profession of engineering. The transitions that we are currently experiencing as we look for alternatives to oil are likely to generate equally profound paradigm shifts. How this will impact the engineering profession remains to be seen. My decision to to take a Masters Degree in literature. This exposure to different ways of thinking and to different types of technology highlighted the importance of an eclectic approach to the problems that we face. 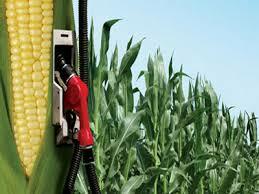 The article I read about ethanol as a fuel. The article noted that what we now refer to as ERoEI (Energy Returned on Energy Invested) of ethanol was low — so low that the use of ethanol really doesn’t seem to make much sense on strictly technical grounds. It is necessary that the resource provides more energy than is used to obtain it. Resource exploitation has to make economic sense as well as technical sense. 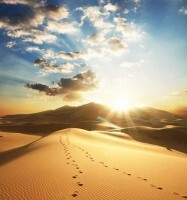 The posts written by Matt Simmons and his book Twilight in the Desert. They introduced me to the concept that oil is a finite resource and that we are using it up. 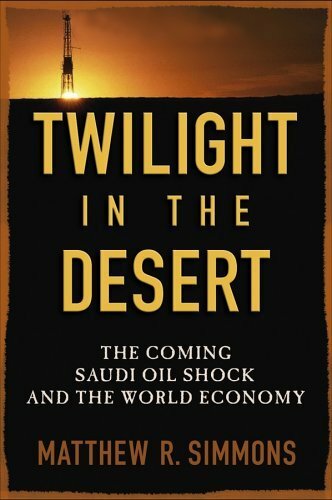 I continue my journey with an introduction to M. King Hubbert and his seminal work on the decline of oil reserves. A similar comment can be made about Hubbert — so much of our current discussions to do with resource constraints has its roots in what he wrote over sixty years ago. Most current Peak Oil writings will eventually be considered as being a series of footnotes to Hubbert. It is also important to understand the culture of the time in which he lived. 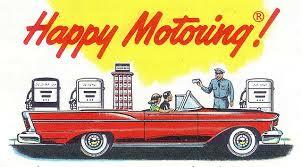 Oil production was increasing and the Age of Happy Motoring was well underway. Nuclear power was going to be too cheap to meter and no one questioned whether infinite growth on a finite planet made sense. Hubbert was courageous. Born in the year 1903 he was at the peak of his powers in 1956. As a leading scientist employed by one of the world’s largest oil companies he was authoritative and credible. The four pages of citations in his paper confirm his commitment to thorough and professional research. He published many papers to do with oil reserves and the rate at which they decline. But his seminal work was Nuclear Energy and the Fossil Fuels presented at an American Petroleum Institute (API) meeting in San Antonio, Texas in March 1956. It can be downloaded here. His basic idea — which seems obvious to us sixty years later but which was far from obvious in his time — was that all oil reserves have a finite life and will eventually be depleted. Geologists in his day knew this about individual oil wells, but he scaled up the discussion to consider reserves in much larger regions, such as the States of Texas and Illinois. His insights resulted in the now famous Hubbert Curve. 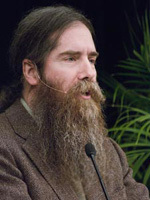 Although Hubbert considered just oil reserves in the United States the principles he used can be applied to any non-renewable resource or to a resource that is depleted more quickly than it can replace itself (such as the forests discussed in Peak Forests). For example Hubbert curves have been developed for coal and for fish stocks in the ocean. He discussed the issue of fossil fuel production in a global context. He recognized the finite nature of fossil fuel reserves. He developed a generic (Hubbert) curve to show how production of fossil fuels peaks and then declines. He understood the fact that continued exponential growth in a finite world cannot continue. He had a grasp of the social implications of his research. Because of its importance and because many of the issues that he raised are with us still it is worth reading Hubbert’s 1956 paper in detail and analyzing his findings and conclusions. His paper is in three parts. The first part analyzes the fossil fuel industry of his time (the early 1950s) and provides forecasts as to likely production rates over the next half century. The second part of the paper is to do with the transition that he expected to see from fossil fuels to electricity generated by nuclear power plants. The third part of the paper, an assumption that society will respond to analyses such as his rationally, is implicit in the overall context of his analysis. 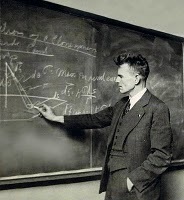 In the first part Dr. Hubbert’s analysis of the fossil fuel industry was profound — the forecasts he made with regard to the future production of oil in the United States were accurate (he also predicted the timing of peak oil production world-wide almost exactly, although his forecasts as to the quantities of oil that would be produced were low, mostly because some major new oil prospects had not yet been discovered in the 1950s.) The following is a quotation from his paper. The fossil fuels . . . have all had their origin from plants and animals . . . during the last 500 million years.Therefore, as an essential part of our analysis, we can assume with complete assurance that the industrial exploitation of the fossil fuels will consist in the progressive exhaustion of an initially fixed supply to which there will be no significant additions during the period of our interest.
. . . world production of crude oil increased at a rate of 7 per cent per year, with the output doubling every 10 years.. . . How many periods of doubling can be sustained before the production rate would reach astronomical magnitudes? No finite resource can sustain for longer than a brief period such a rate of growth of production; therefore, although production rates tend initially to increase exponentially, physical limits prevent their continuing to do so. This rapid rate of growth for the production curves make them particularly deceptive with regard to the future length of time for which such production may be sustained. The above statements lie at the heart of his thinking: reserves of fossil fuels are finite; they cannot be replaced except over many millions of years. Hubbert also drew a clear distinction between the three kinds of fossil fuel (solid, liquid and gaseous) but did not anticipate any issues to do with moving from one to another. 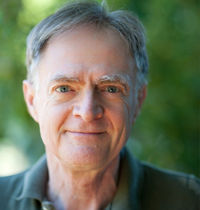 The very title of his paper – Nuclear Energy and the Fossil Fuels – shows Hubbert’s fundamental optimism. 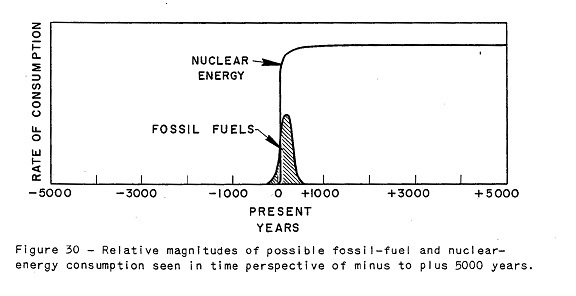 He anticipated that society would make a smooth transition from fossil fuels to nuclear power and that economic growth could continue, as shown in the above sketch, which is taken from his paper. Consequently, the world appears to be on the threshold of an era which in terms of energy consumption will be at least an order of magnitude greater than made possible by fossil fuels. This prediction missed the mark. Although the nuclear power industry now constitutes an important part of the overall energy mix, the optimism that Dr. Hubbert showed regarding the transition from fossil to nuclear fuels has not occurred in the manner that he anticipated. First, it turns out that different energy sources are not nearly as fungible as was thought in the 1950s. 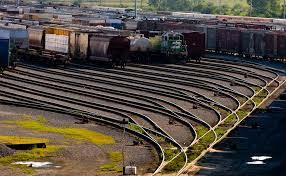 The world now has close to a billion vehicles (automobiles, trains, airplanes, trucks, ships) that run on fossil fuel. Although we see some attempts to introduce electric cars, the reality is that electricity from nuclear power plants is not a direct replacement for gasoline and other refined products, at least not on a realistic time scale. The civilian nuclear power industry was just getting started in 1956 with promises of energy that “would be too cheap to meter”. In hindsight it is now evident that Hubbert was too optimistic. Although the nuclear power industry meets a large fraction of the world’s demand for electricity, it has not been the savior that Hubbert anticipated. Costs have been much higher than anticipated, accidents such as Chernobyl and Fukushima-Daiichi have shaken public confidence to do with the safety of the industry and issues to do with the disposal of radioactive waste remain unresolved. Throughout his paper lies an unspoken assumption that, when presented with the facts and analyses shown in papers such as his, then we, as a society, will take the appropriate actions. In 1956 there was sufficient time to make the transition from an oil-based society to one that derives most of its energy from nuclear power. We have since learned to be more cynical — people generally do not plan for the medium or long-term future. They look mostly to satisfy their own immediate needs and wishes. But it does pose as a national problem of primary importance, the necessity . . . of gradually having to compensate for an increasing disparity between the nation’s demands for these fuels and its ability to produce them from naturally occurring . . . petroleum and gas. We can now see that Hubbert was rather too hopeful, maybe a little naïve. It seems as if he thought that, by merely identify the problem, society would respond appropriately. That did not happen. No serious attempt was made in his day to address resource constraints — little has changed since then. This is the fourth post in the series “Engineering in an Age of Limits”. We are facing limits in natural resources, particularly oil; there are limits to our finances (money seems to be increasingly disconnected from actual goods and services); and there are limits to how much we can continue dumping waste products into the air, the sea and on to land. In last week’s post I briefly described the development of the Mechanical World View. Men such as Francis Bacon, René Descartes and Isaac Newton created a model that still provides the mental framework for most of us. Their model was objective (Bacon), mathematical (Descartes) and provided predictable results (Newton). It also provided the intellectual basis for the Industrial Revolution which started in the early 18th century with the development of Thomas Newcomen’s steam engine (described in the post Peak Forests). In this series of posts I try to think through how the discipline of engineering will change in response to the approaching Age of Limits. This means that engineers need to understand that they live of unpredictable human beings who often make foolish or magnificent decisions that make no sense in a Newtonian world. With regard to the Age of Limits it is tempting for engineers, who tend to be rational and who will go where the numbers take them, to look just at the facts of the situation: resources are dwindling and the environment is being degraded more and more. Therefore we need to find a technical solution to solve these problems. End of discussion. Not so fast — when discussing the Age of Limits we need to recognize that there are at least four strands to the conversation. The first two — resources and environment — are technical and can be modeled quite accurately. But the other two strands — finance and politics — have to be understood and handled quite differently, not least because they operate on different time scales. The second strand, Environmental Limitations, is also fairly easy for engineers to follow, although it is more complex than Resource Limitations. We can create Newtonian-style models to predict how the climate will change in response to increased CO2 concentrations, or how quickly coral reefs will dissolve as the oceans become more acidic. Admittedly, these models are very complex — the earth is a big place and there are many, many variables to consider. Still, we seem to have an understanding as to how the environment is being degraded. A resource exists; we can use it only if it makes economic sense. For example there has been much discussion in the popular press in recent years about “Saudi America”. The basic idea is that the United States has enough oil in its shale and deepwater deposits that there will be no need to continue importing oil from other countries. The catch with many of these articles is that they look only at the amount of oil in the ground and that can be theoretically extracted. They do not consider how much it costs to do so. Let’s say that Saudi oil can currently be produced for $30 per barrel (the actual figures are, of course, highly proprietary). The corresponding cost for shale oil seems to be north of $80 (and rising due to the very fast depletion rates). For new deepwater formations a figure of $130 per barrel seems to be credible. Given these disparities the United States will never be “Saudi America”. Moreover, the Saudi oil is onshore in relatively shallow wells. If something were to go awry they can quickly correct the problem. With deepwater such is not the case. We are currently recognizing the fifth anniversary of the Deepwater Horizon/Macondo catastrophe. Not only did eleven men die and the nation suffer its worst-ever oil spill, the financial losses were large enough to almost bankrupt BP — one of the largest oil companies in the world. 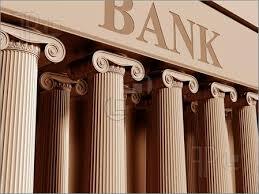 Sooner or later the amount of money in circulation has to align with the products and services that can be purchased. How all this will shake out is anyone’s guess, but we cannot detach the world of money from the world of engineering. 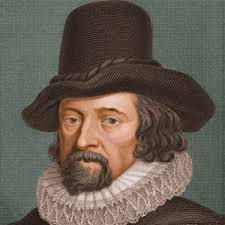 Many people judge issues not according to the facts (as Francis Bacon would have them do); instead they develop opinions based on their their built-in biases and preferences, thus creating the fourth strand: Politics. The obvious example here is the politicization of the Global Warming/Climate Change issue, which, at least in the United States, seems to have divided straight down party lines. Given that scientific results always have some ambiguity or inconsistency it is always possible to cherry-pick information to support any point of view that you care to select. People are prejudiced in the full meaning of the word; they “pre-judge”. The normal response to such reactions is to produce reports and computer models that demonstrate that they are wrong. This approach is, to the say the least, likely to be highly counter-productive. Politics also shows up in a more explicit form. Policies ranging from economic sanctions all the way to all-out war create some obvious dislocations to the supply of fuel and other resources. The environment is warming because we are burning oil products such as gasoline and diesel. They create putting CO2 that traps solar energy. A decline in oil production will result in lower emissions and so the global warming problem becomes less serious. But — if oil is not available it will be replaced by coal, which creates much more CO2 per unit of energy created. So the global warming problem gets worse. The above is a trivial example, but it illustrates how important it is not to view each of the four strands in isolation. Do the Math (Tom Murphy). As I was wrapping up this post I stumbled across a fascinating survey result at Tom Murphy’s Do the Math site. It is to do with the Briggs Myers system for categorizing different personalities. The following chart and quotation are taken from his post. The result was pretty stunning. 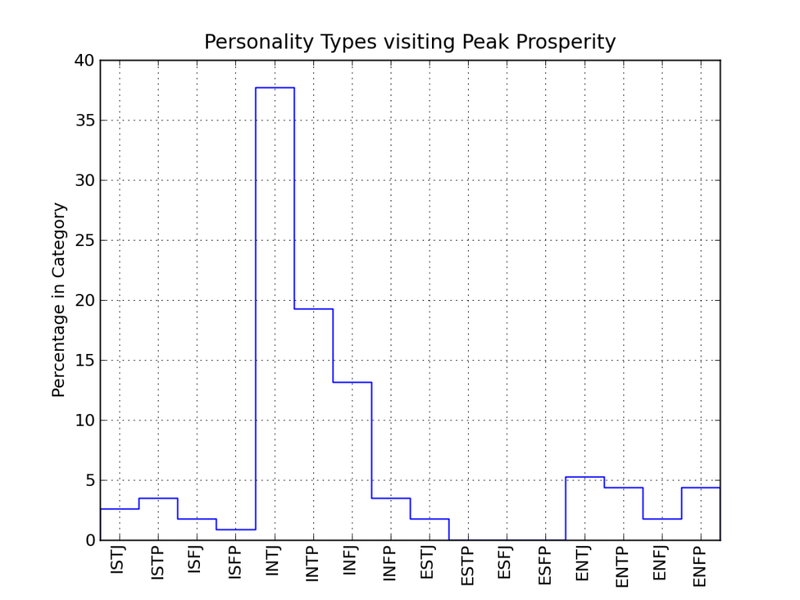 Of the 114 responses, site visitors were dominated by INTJ types (43 in number, or 38%), even though this group constitutes about 2–3% of the population. The website appears to be highly selective . . . If accurate, the implication is that less than 8% of the entire human population is likely receptive to the cautionary message on Peak Prosperity (and by extension, Do the Math—the numbers from which suggest an even smaller number). That’s a small fraction of the population, and likely well short of a “critical mass” for preventive action. So we may be committed to crisis. This result merits further discussion in future posts. Suffice to say that, if we are to develop a broad-based understanding as to where the engineering profession is going, then publishing analyses and graphs won’t do it — we need much more effective communication strategies. Incidentally, this is how one site describes INTJs. I conclude that the most urgent task facing engineers and those that are concerned about our transition to the Age of Limits is to figure out to communicate with others. We do not need more studies or reports — we need to somehow engage people’s attention and to encourage honest discussions that are not pre-judiced. How this might be done we can discuss in future posts. One example has already been provided in That would be telling. We all think in terms of stories — so we should be telling stories, not writing reports (or blog pages). This is one of the many insights of John Michael Greer that I have found so useful; for example in his post The Stories of our Grandchildren.